There are some things that you should take into account and prepare for before you attempt to install and configure the Déjà Vu X3 COM+ Server for deployment in your organization. The COM+ Server can be run in a VM without any problem if the host can allocate it the necessary resources. The use of a fast storage subsystem is recommended. For fewer users fast 7200 RPM drives will be adequate, though SCSI drives and RAID 0 or 5 arrays are recommended, particularly for more users. Storage for the server can be provided on a SAN, but using direct-attached storage will result in better performance and is therefore preferable. The COM+ Server should only be installed in Server editions of Windows (2003, 2008, 2012, etc.). While it is possible to install it in consumer editions (e.g. Vista, 7 or 8), the consumer editions of Windows have certain limitations compared to the server editions that will limit the COM+ Server’s functionality. The COM+ Server and the Déjà Vu X3 application must not be installed on the same computer. They interfere with one another and will render each other inoperable. The correct setup is to set aside a computer to act as a server, which will store the shared databases and run the COM+ Server, while the translators each run Déjà Vu X3 on their own computers. The COM+ Server requires a Windows shared folder on the server computer (more in the next section). This share must be accessible with Read and Write access from the client computers and by the users who will use Déjà Vu X3 on these computers. If your network is configured in such a way that a shared folder on the server cannot be accessed from the clients, the COM+ Server cannot work. Single databases cannot be larger than 2 GB, they will fail after this point. If more than approximately 15 users access the same database through the COM+ Server, there is a risk that the database may suffer small data corruption. This can corrected by using Déjà Vu X3’s repair function regularly or by limiting the number of users accessing a single database. If, rather than install the COM+ Server for Déjà Vu X3 for the first time, you want to upgrade an existing installation of COM+ Server for Déjà Vu X2, you must uninstall COM+ Server for Déjà Vu X2 completely before installing COM+ Server for Déjà Vu X3. If you do not uninstall the older server first, certain files that COM+ Server needs will not be updated, and it will not work correctly. 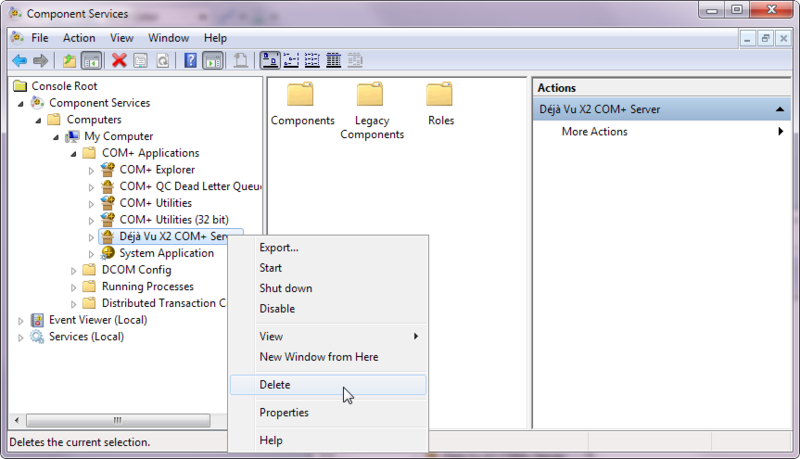 Once you have finished uninstalling the COM+ Server for Déjà Vu X2, you should check the Component Services application to make sure that all traces of the COM+ Server have been removed. Open the Component Services application, then navigate to the node Console Root>Component Services>Computers>My Computer>COM+ Applications, and check what COM+ applications exist. If you find one called Déjà Vu X2 COM+ Server, delete it. The configuration of the operating system is exactly the same, so, once you have installed COM+ Server for Déjà Vu X3 you will not need to modify the configuration of the shared folders, user accounts or COM Security. However, we still recommend that you follow the rest of the advice in this guide to make sure that everything is setup correctly.